E.B. White, author of Charlotte’s Web and Stuart Little, once wrote that ‘we would stand a better chance of survival if we accommodated ourselves to this planet and viewed it appreciably instead of sceptically and dictatorially.’ Instead, ‘our approach to nature is to beat it into submission’. These words feature in the epigraph of arguably the most famous environmental text of all time - Rachel Carson’s Silent Spring - and appropriately echo the primary message of Carson’s work. That is, the question of ‘whether any civilisation can wage relentless war on life without destroying itself’. But who was Rachel Carson and why is her seminal work not studied more often in today’s schools and universities? I was personally surprised when I found myself halfway through a degree in both literature and science with little to no knowledge of this woman and her role in kick-starting the modern environmental movement. It is clear that her influence has perhaps had more of an impact in the U.S. than here in Australia. However, I believe that now more than ever do we need to utilise her work to implement positive change within our nation’s environmental perspectives. Carson was a marine biologist who took a keen interest in literature and writing from an early age. Prior to the success of Silent Spring, Carson worked at the U.S. Bureau of Fisheries where she analysed fish population data. She began to publish various articles in her personal time relating to marine biology, eventually expanding her ideas into a book titled Under The Sea Wind, which would later become the first in a trilogy of ocean-themed books. 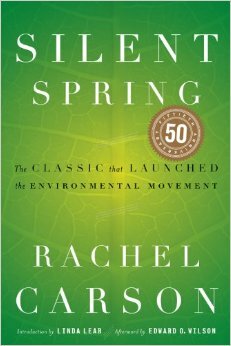 Most significantly, Silent Spring is one of the best modern examples of how the power of words can change social and political perspectives. The text focuses on the dangers of pesticide chemicals such as DDT within homes, farms and the natural environment, and was one of the defining arguments against the use of such chemicals. Following its publication in 1962, Silent Spring and its incredibly novel ideas came to the attention of American President John F. Kennedy. The work began to encourage the expansion of grass-roots environmental campaigns and instigated governmental investigations into the use of pesticide spraying. Carson passionately believed that it should be the ‘right of the citizen to be secure in [their] own home against the intrusion of poisons applied by other persons’. The resulting ban on agricultural DDT is testament to the power of both Carson’s words and the groups that fought for the appropriate legislation. However, the fact that DDT was even an issue to begin with is also testament to the terrifying dangers that humans can inflict on the environment and themselves. Carson had an immense love for the ocean and a passion for Marine Biology. Carson's seminal text has been published in various editions since its release in 1962. With the Australian Spring beginning and the allure of Summer just around the corner, I believe it difficult for any Melbournian to experience the sunnier portion of our year as one without the playful behaviours of our familiar endemic fauna, or the vibrantly blooming flowers of our unique native plants. The natural world is a part of everyday life, even for those of us who view it as a separate entity to that of the human. To reiterate Carson’s own message, can we as Melbournians – citizens of a thriving city of green parks and fascinating wildlife; of unique landscapes and sublime ocean waters – live with the knowledge that many anthropogenic behaviours may lead to the destruction of exceptional habitats and the disappearance of countless species? Can we live in this city whilst knowing that what once made our state beautiful is gone, possibly forever? Carl Sagan once said that ‘an organism at war with itself is doomed’ – let us hope that this organism does not continue to be the human.